Dr. Clark has served as a principal of Abraham Clark Consulting, LLC, a health and regulatory policy consulting firm, since November 2011 and consults on health policy, regulatory affairs and leadership development. She is the retired senior vice president of Global Public Policy and External Relations and chief sustainability officer of Kellogg Company, a food manufacturing company. She served as senior vice president of Global Public Policy and External Relations from 2010 and chief sustainability officer from 2008 until 2011. 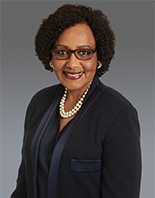 Dr. Clark joined Kellogg in 1977 and held other senior management positions, including vice president of Corporate and Scientific Affairs and senior vice president of Global Nutrition and Corporate Affairs. She also served as president of the Kellogg Corporate Citizenship Fund, Kellogg’s philanthropic entity, and was responsible for Kellogg’s corporate social responsibility initiatives which focused on community engagement, economic development, arts and education, and health and wellness. Dr. Clark is an adjunct professor at Michigan State University in the Department of Food Science and Human Nutrition. Dr. Clark is a member of the board of directors of The Hain Celestial Group, Inc. She has previously served as a director of several other public and private companies, and currently is member of the board of trustees of W.K. Kellogg Foundation. She earned her Bachelor of Science degree from Southern University, Master of Science from Iowa State University, and Ph.D. from Michigan State University.